We woke up early on our second day in Bali. Maximising travel time! There are lots of places to see on the island, so a few days really wasn’t enough for us. The morning view, though, was excellent. From our room on the second floor I could see the ‘pura’ (shrine) area. 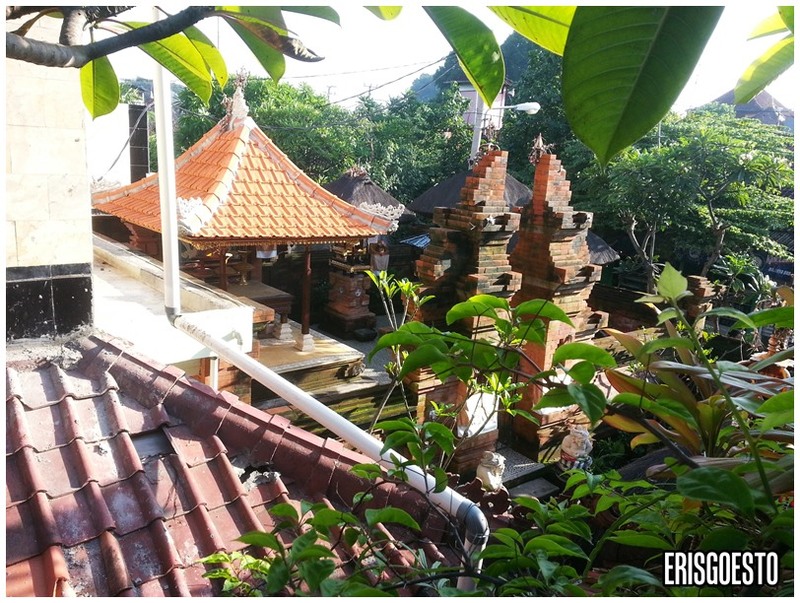 90% of Bali’s population is Hindu. They pray three times a day, and it’s a common sight to see the men in their white shirts and sarongs going for prayers. Small ‘boxes’ of prayer items, which contain sweets, fragrant flowers and incense, are often left around the shrines. We had breakfast in the hotel cafe. The staff were friendly enough, but service was laid back. We had to wait half an hour for our food, even though it was just us and two other customers. Had fried eggs, bacon (yes, pork. ), toast and orange juice. 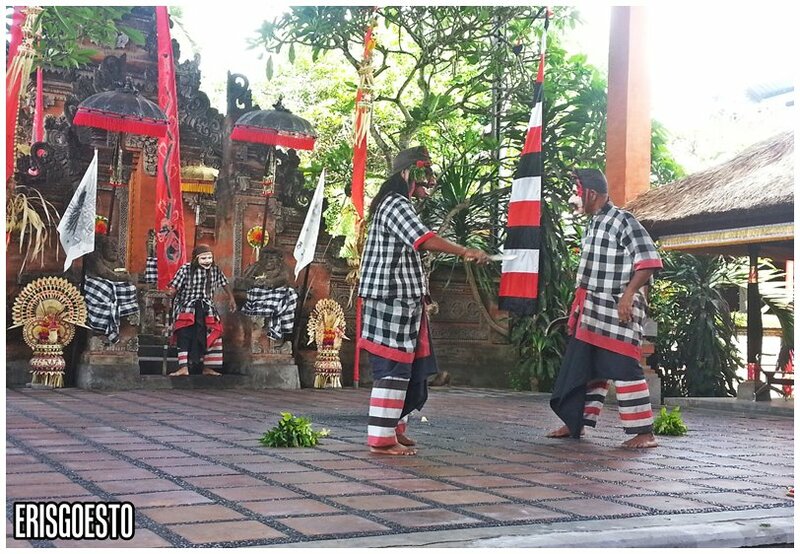 Toto came to pick us up, and we headed to Sari Wisata Budaya cultural centre in Denpasar for a taste of the Balinese culture. 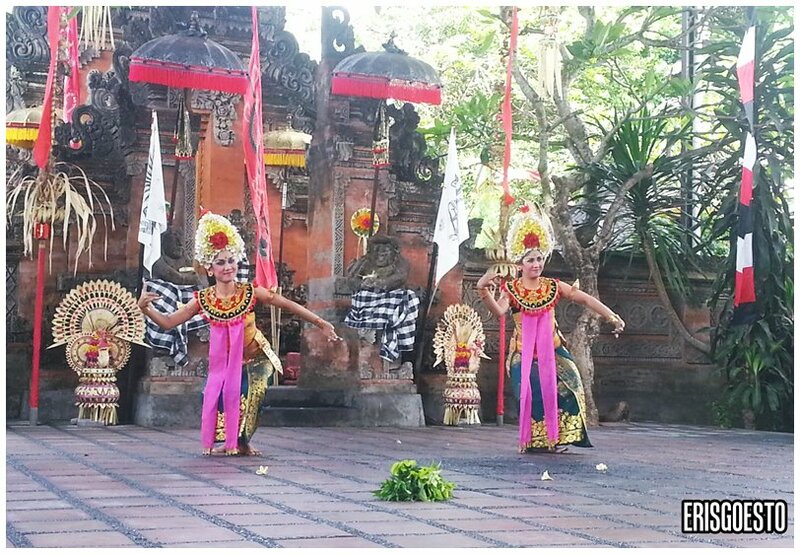 They perform the Barong dance here, which is a traditional Balinese dance interwoven with strong elements of Hinduism and local Indonesian beliefs.Reviews online weren’t so good.. most people thought it was a rip-off (entry is 100,000 rupiah per person) and some felt the music was too loud. 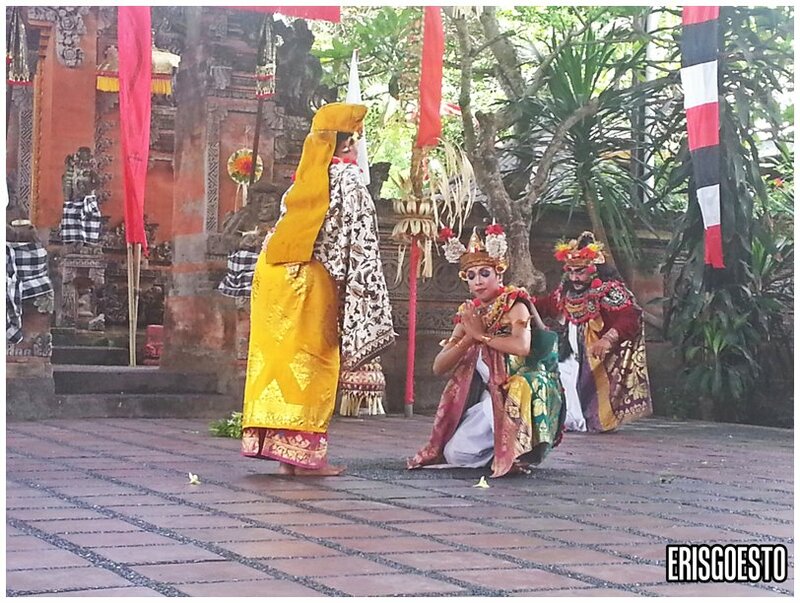 Personally, I enjoyed the live music of the gamelan as I felt it added an authentic touch. Most of the crowd in the auditorium were Australians. The show started off with a short ‘prelude’ of music. It was amazing how the simple instruments could create such charming sounds. The beauty of the music was in it’s simplicity and repetition. The ‘dance’ was a play of sorts. 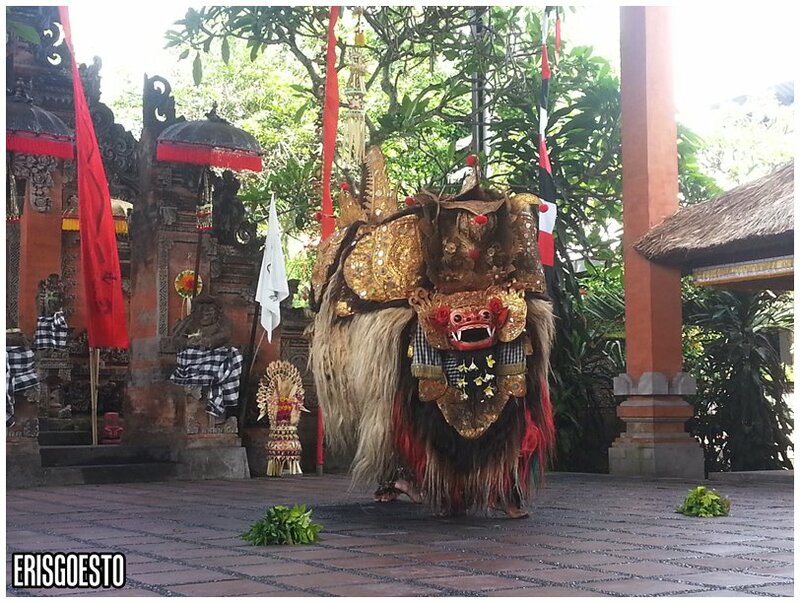 The Barong, a mythical lion-like creature, made it’s first appearance. I loved the costume! It had intricate layers of red, black and gold, with bells that jingled every time the dancer made a movement. The masks in the play reminded me of Japanese Oni. 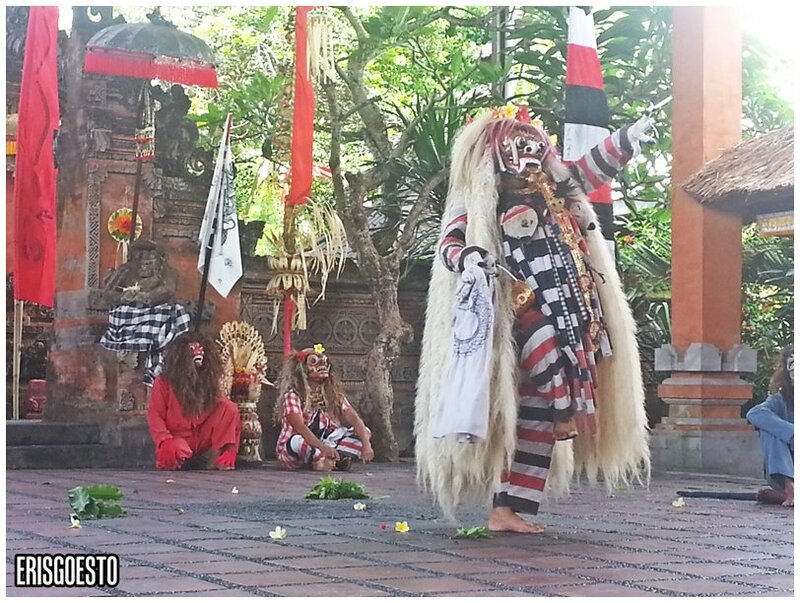 The Barong, or ‘king of spirits’, represents the power of good. It looked kind of like a Pekingese, with it’s wide face and shaggy white fur. 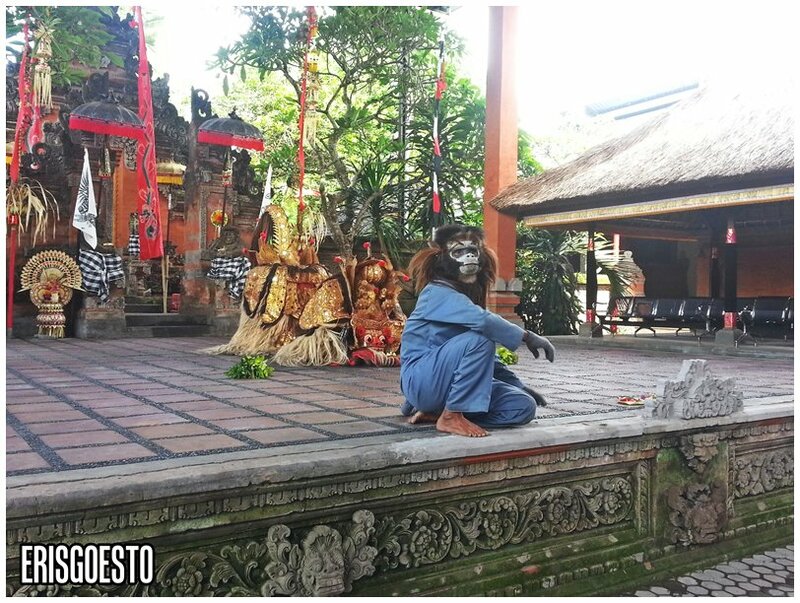 The dancers were extremely skilled in their mannerisms, such as when the Barong sat down to ‘lick’ it’s paws. Anyway, it was rather difficult to understand the story because they didn’t have dialogue and the translation on the brochure was really bad. 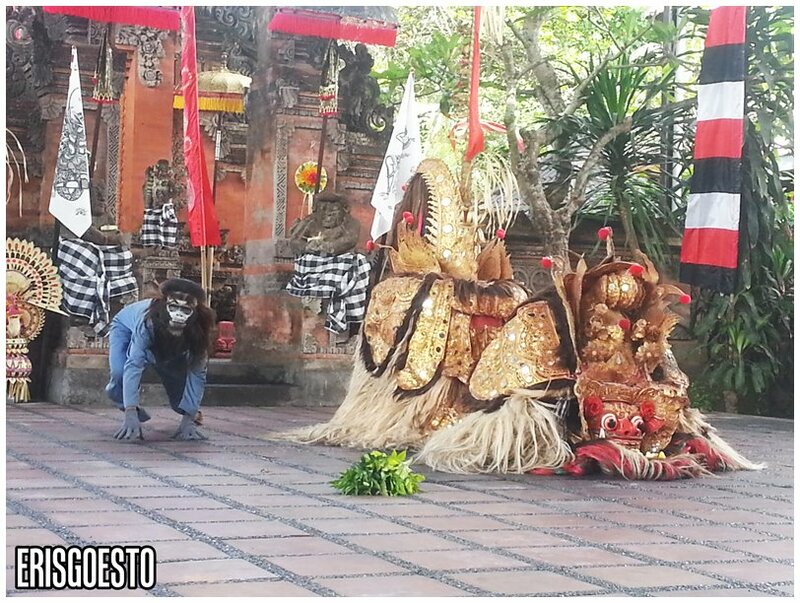 From what I gathered, the Barong was in the forest just chillin’, and then it’s companion, a monkey, turned up. I felt that the monkey was really good. The mannerisms were superb, and the actor playing it was agile and stealthy, just like a monkey. He often climbed up onto a tree nearby. He was also really cheeky- at one part of the play he looked at me and made me a heart shape with his hands lol. Shortly after, three villagers appeared and drove the animals away. We then moved on to the next scene. Two pretty young girls played the part of servants looking for the ‘Minister’ (sorry, I forgot the name of the character.) Their dance moves, while nothing big or fancy, had a fluidity and grace difficult to achieve without years of practice. Their faces were also very expressive. 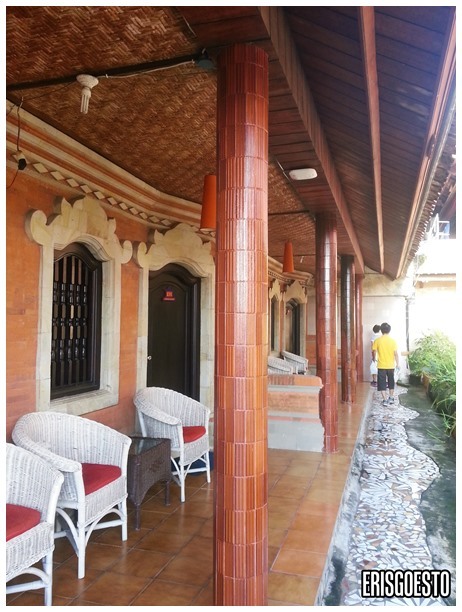 Those sarongs they were wearing were difficult to move in as they were wound tightly around their waists. Head dress full of flowers must have been heavy too. Next came the servants of the Minister, one dressed in black and the other in white. A ‘witch’ character came in, seemingly invisible to the actors, and caused discord among the two. They were broken up by the arrival of the ‘Minister’. I’m quite confused by the storyline. I think this is the part where the hero (let’s called him Prince. Prince was played by a girl) came in with his mother, who wanted to leave him with the Minister. Somehow the ‘witch’ character came in again and caused the both of them to be mad, hence sacrificing the ‘Prince’ to the evil antagonist of the story, the Rangda. 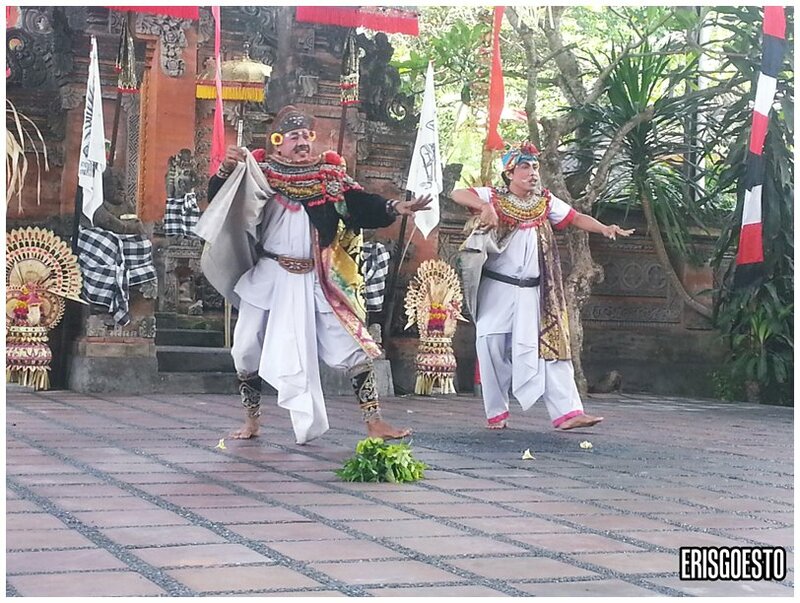 Rangda means widow in old Javanese, and is supposedly a practitioner of black magic. Once again, magnificent costumes. With long white hair, an angry face and stripes across the body, the demon queen, or Rangda, gets ready to devour the Prince. However, the Hindu god Vishnu bestows his protection on the Prince, making him invincible. Try as she can, the Rangda cannot kill him. A battle ensues, where the Rangda turns into various animals, such as a boar and a bird, trying to kill the Prince. 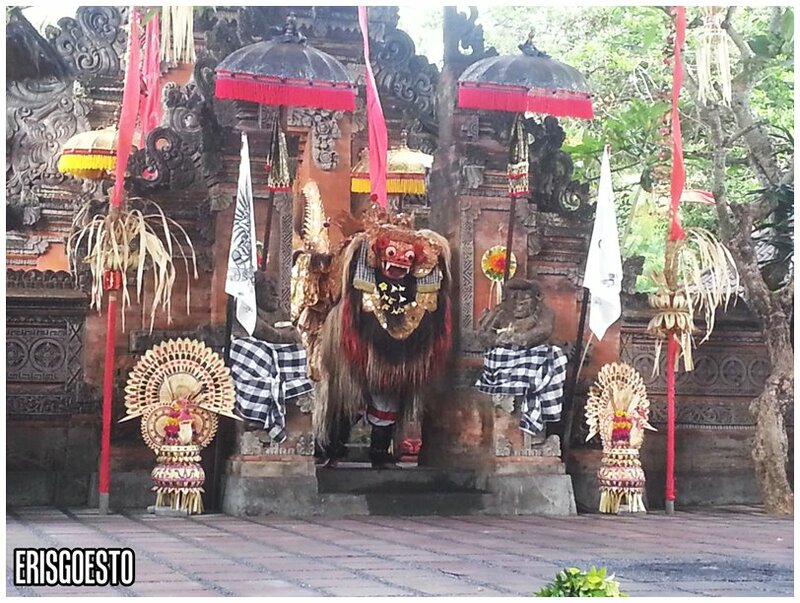 After a battle with the lion, the Rangda has to face the Barong’s followers, who are all wielding keris (a traditional crooked dagger from the Indonesian peninsula). Part of the performance also involves the performers stabbing themselves with the knives. (Yes, they are real knives!) Apparently if not done properly and without blessings, the performers can be seriously hurt. Anyway, the Rangda is finally defeated by the Prince, representing triumph of good over evil. If you’re a fan of local culture, I highly recommend seeing the performance. Ofc there will be cheaper, more ‘authentic’ versions, but I enjoyed this ‘touristy’ one immensely either way.